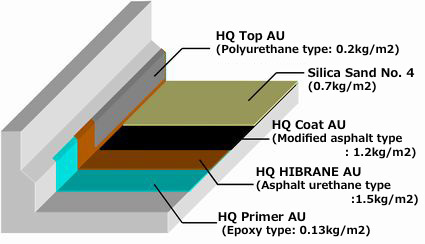 The HQ HIBRANE AU construction method is a waterproofing method for high durability asphalt urethane membrane type deck slab, targeting concrete deck slabs. This deck slab waterproofing method enables seamless work from the deck slabs to the raised edge parts, and also realizes outstanding adhesion with the paving. This high performance waterproofing method complies with the required performance (Grade II) of the NEXCO standards which assume a design durabilityof 30 years (Structure Construction Administration Requirements: July 2015). Construction work can be carried out seamlessly from the deck slabs to the raised wheel guard. Because special modified asphalt is used as the adhesive for the paving, the adhesion with the paving is also outstanding.